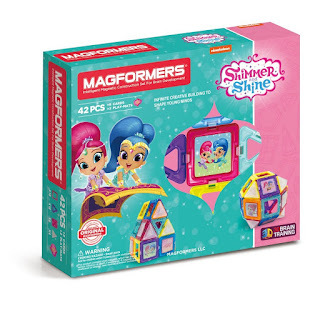 RUN over and grab this *BEST PRICE* MAGFORMERS Shimmer and Shine Set (42 Piece) $25.49 (Retail $49.99)! -Includes 30 Magnetic Shapes, 8 Inserts, 4 Diamond Jewels, 8 Shimmer and Shine Double-sided Characters cards, and 2 double-sided play mats. -Compatible with all Magformers shapes and accessories. -Neodymium Rare-Earth Magnets for guaranteed connectivity.